Safety gear comes in many forms, (hopefully) protecting a given area of the body from injury. Hardhats, goggles, steel-toed boots, fire suits, etc. Motorcyclists, particularly those who ride and race sport bikes sheath themselves in leather suits. If you scan the local shops and internet, there is an almost overwhelming amount of choices available when considering a set of leathers that cover both the price and quality spectrum. As with most material objects of our desire, there is an upper and lower end of the scale for affordability, and while we aren’t likely to show up to the track wearing a $200 set of leathers, we’re probably just as unlikely to bling out on $2500 leathers. Balance is the key here, being rational about purchase price while giving up as little as possible in quality and safety features. 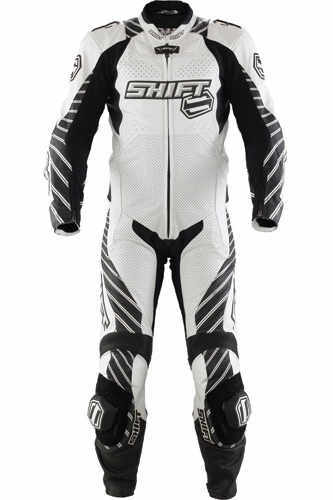 Enter the Shift Vertex racing suit, which essentially gives up nothing at a reasonable price. Made from 1.2-1.4mm thick cowhide, the feel of the leather is one of high quality, as is it’s appearance. Inspection of seams and stitching goes even further to reinforcing your impression that you have purchased a serious piece of gear. It is. Double layers and padding in key areas give added impact and abrasion protection. Removable CE-approved armor is found in the elbow, shoulder and knees. The mesh liner is removable as well for trips to the washer to help keep the new-leather smell as long as possible. An X-Stretch crotch panel allows enough range of motion to accommodate a 14 year-old gymnast (probably), so I definitely had enough movement available. Kevlar stretch panels above the knees and elbows, across the lower back and at the latissimus area give great flexibility while providing abrasion protection. For the days when you’re bakin‘ out in the canyons or on the track, air inlets at the top of the shoulders and outlets in the speed hump, along with the perforated chest panel, move a lot of air to help keep heat exhaustion at bay. The forearm and leg closures have semi auto-lock zippers. The zipper pulls themselves are ergonomically designed to make them easy to locate and grip with gloves. Close up the collar on the velcro and a comfortable neoprene layer lays against exposed skin, so chafing should not be an issue. On the days when you’ve lost track of time while enjoying a day’s ride, reflective piping in several seams aid with making you visible to everyone else. An inner pocket in the liner gives the rider a place to put a wallet, or transponder for track days. Everywhere you look, attention to detail is obvious. The needle on the style meter rides far to the right with this suit. Friends I ride with, and even the occasional stranger has noted it’s good looks and quality construction. Color combinations available are black with white trim, white with black trim or a colorful combination of green, red, yellow, black and white in a “throw paint at my suit” color scheme. The latter color combo was not available when we took delivery, otherwise I would have liked that. It’s eye-catching, and slightly obnoxious (in a good way). The suit is cut to fit properly while seated on the motorcycle. That means when you’re off the bike and try to stand up straight, it’s going to be (or should be) a bit tight and uncomfortable in the crotch and tight over the shoulders, and the sleeves riding slightly up your arm. 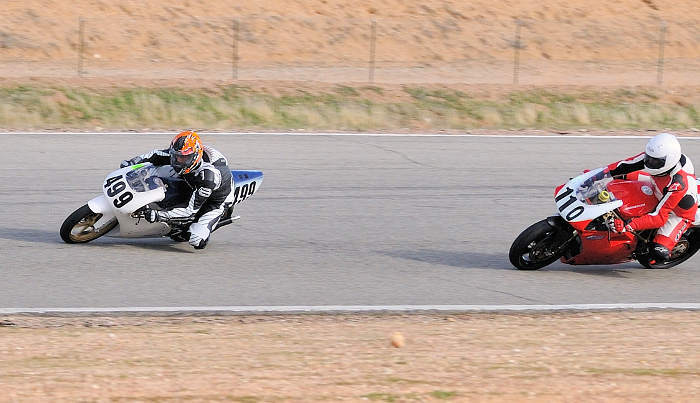 In the sport bike riding position, everything should fall neatly and comfortably into place. The first suit sent to us (based on a guess from my input) was too tight. Going one size up resulted in a perfect fit in all areas, something I’ve never experienced from an off-the-rack suit. While I have full movement in any direction I care to move on the bikes (Honda RS125 & CBR1000RR), the suit still fits snugly enough that I know if I were to go asphalt surfing, the armor would stay in place and do it’s job, instead of rolling or moving out of position. The 125 I race is an especially small motorcycle that places a premium on either being small, or very flexible. I am not the former, but fortunately am somewhat the latter, and all the stretch panels built into the suit not only allow me to fold into a tuck without binding or bunching up, they also give the (speedy) freedom of movement needed to keep up with the RS’s cat-quick movements. The knee sliders are good. Just grippy enough to give good feedback, and still able to skim smoothly along the pavement. Wear on them has been negligible, although I don’t put much pressure on them. Street rides on the CBR in this suit are very comfortable, with the suit’s obvious protective credentials giving a confident feeling of assurance. Wearing a back pack (I like to bring camera gear with me), caused the pack to ride against the speed hump during deeper lean angles, which then was forced upward against the lower edge of the helmet. Adjusting the pack to ride lower on my back, and lowering the elbows slightly kept the hump from making further contact. I’ve gone on and on about how good this suit is, but I’m likely someone you’ve never met, and so you might need further validation of this suits qualifications. For starters, consider that riders the likes of Josh Herrin (current points leader of the Daytona Sport Bike class), up-and-comers Michael Beck and Clint Shobert (son of Bubba Shobert) all wear the same leathers available to you. Not satisfied? 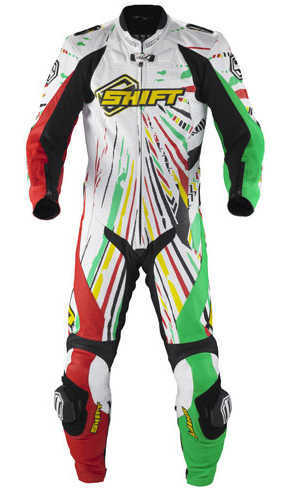 Nick Ienatsch, a successful racer of many years, a former Freddie Spencer riding school instructor and highly respected motojournalist wears this suit. 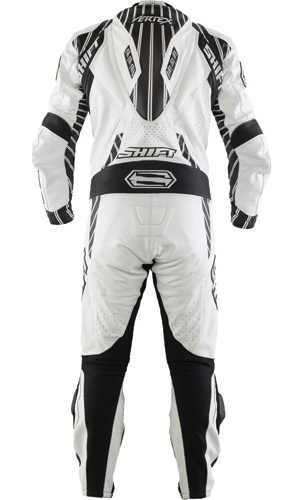 Go to a club racing event, you’ll likely see a fair number of Shift suits there as well. Although I thankfully have not crashed so far this season, I have observed others who have and their Shift suits, although scuffed up, did not wear through, or suffer any seam failures and were ready for more. I have a ‘wall of death’ – previous suits that either cost less, about the same, or a bit more than the Vertex suit that turned out to be ‘one hit wonders’, essentially throw-aways. I’m confident that the Vertex will not ‘fall’ into that category…. Do I have any gripes? Yes – well, no, not really. At first, the zippers on the legs and arms would capture the liner and bind up. Moving the liner slightly inboard on the velcro strip, away from the edge where the zipper travels took care of the issue. Break-in when the suit was new was negligible. I wore it around the house a couple times, but it became apparent that it wasn’t really necessary, and I was wearing it just because I just wanted to wear it – and that new leather smell….. The Vertex gloves are another high quality item from Shift that gives a lot of bang for the buck. These gloves have a long gauntlet that reaches well past the cuff of the sleeve, and a large velcro closure. A wrist closure cinches around the small of your wrist to keep the glove on your hand should you end up flailing and rag-dolling down the road or track. Along the knuckle area and two middle fingers, you’ll find a composite material shield offering impact protection. On the index, middle and ‘ring’ fingers you’ll see effective air inlets to help cool the digits. Perforations along the back of the glove also aid in keeping the hand cool. An open-back design gives the glove a lot of range of motion to allow easy closure of the hand to grip the handlebars. A similar setup on the backs of the middle fingers and thumbs adds another layer of protection without compromising flexibility. Extra layers of leather in the palm area and on the thumb add abrasion insurance in these high stress areas, along with extra padding in likely impact areas. If times are really hard and you’re wearing through the glove, a full Kevlar liner provides a final barrier between your epidermis and the asphalt. These gloves proved a little problematic for me, sizing-wise. Normally, I wear a size large glove. Larges were too small, and extra larges were still a bit on the small side. I took the extra larges, knowing the leather would eventually stretch enough to be a comfortable fit. It took a while, and it was pretty uncomfortable until they stretched adequately, but once fully broken in, they fit very well. I have gone through this with most gloves I’ve owned, so I chalk it up to my hands being in between sizes. Finger and thumb lengths are just right, and despite the added layers of leather and padding, the glove remains very flexible. 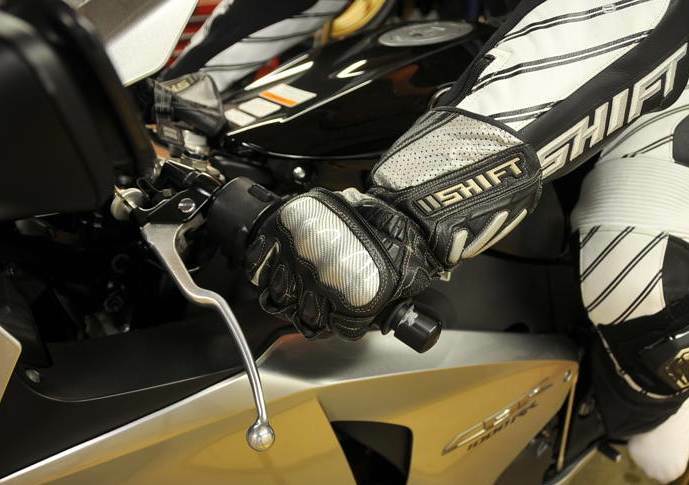 While racing / street riding, the gloves provide a precise, tactile feel. Grip was good, without being too good and hanging up on the grip, so adjusting your hand position doesn’t require a substantial adjustment of pressure. My only complaint about the glove is the fuzzy portion of the velcro on the wrist strap is wearing out, and so is not as secure as it once was. To be fair, I ride a lot on the street and these gloves are used every day, and so this may be a normal wear issue. Still, the rest of the glove is in perfect condition. As I reported with the Vertex suit, I haven’t crashed with these on, and so that part of the review remains a question, but as with the suit, I am confident of the level of protection they’ll provide in case things don’t go according to plan. At $129.99, these gloves punch comfortably above their weight in the value-per-dollar fight, providing features of comfort and protection found in their higher-dollar competition. Great value, protection and style.